A lorry driver who swigged from a bottle of vodka before getting behind the wheel of his HGV has been banned from the road. A sheriff has ruled that a crash that claimed the lives of two lorry drivers was caused after one of them fell asleep at the wheel. A man has denied badly injuring a fellow HGV driver by dangerous driving, following a crash on the A66 between Penrith and Appleby. The speed limit on a busy north-east commuter road where there have been several crashes could soon be reduced. Proposals have been lodged with Aberdeenshire Council to drop the limit from 60mph to 50mph on the A944 Aberdeen to Alford road at Kirkton of Skene. The news comes just a day after three cows died when an articulated lorry carrying the cattle came off the road and landed in a ditch. The council wants to reduce the limit just north-west of its junction with the B9126 Gairlock Smiddy, up to the start of the 30mph limit at Elrick. The road has been the site of several collisions. In February a 44-year-old man and a young girl were taken to hospital after a lorry overturned and landed on their car. The man was cut free from the car after it ended up leaving the road and landing in the front garden of a house. And in December last year a busload of school children had a lucky escape after they were involved in a crash at the A944 junction with the B9126. The bus was left badly damaged, with a large portion of the offside caved in and the window shattered. The driver was charged with careless driving. Councillor Iris Walker, who represents Westhill, said: “I’ve lived near it for a while now and there have always been crashes on that road. The police were very keen when it went to committee to do something to improve safety on that road. “There have been a lot of local people calling for something to be done to improve safety. “There are a number of quite bad junctions on the A944, so anything that can be done to reduce the risk of accidents can only be a good thing. The consultation will run until August 25. Comments on the plans can be made by writing to [email protected] or Head of Legal and Governance, Woodhill House, Westburn Road, Aberdeen, AB16 5GB. 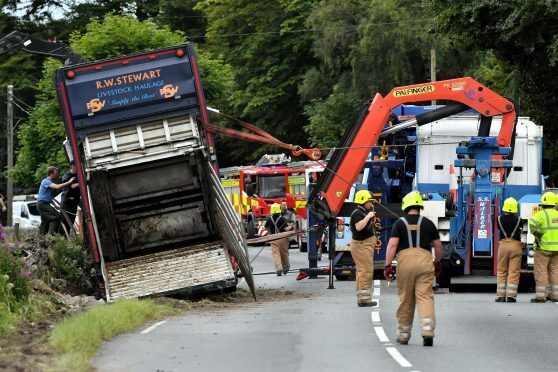 The HGV was travelling on the A944 between Westhill and Dunecht at 2.05pm yesterday when it left the road.